Doncaster Museum Service holds in their collection an oil painting called ‘The Golden Bough’, listed as being by J.M.W. Turner, but needed supporting evidence for this, other than the inscription on the reverse of the piece. 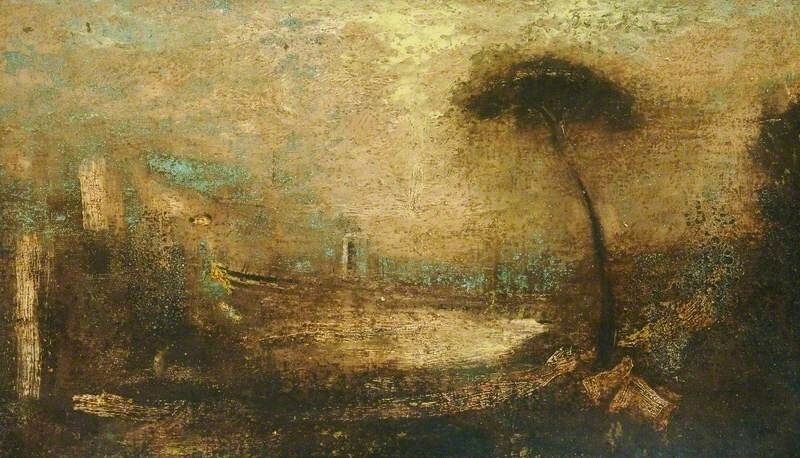 Andrew Greg remarked that the composition was similar to that of Turner’s ‘The Golden Bough’, exhibited in 1835, of which Tate holds a watercolour sketch, dated c. 1820-1830, and an engraving by Prior for the Art Journal c.1860. He mentioned that, with the poor condition of both painting and inscription, plus some strange square brush-strokes over the painting, that any firm attribution was unlikely to be reached. Richard Green said that the attribution to Turner was over-optimistic, and thought it to be a sketch or unfinished painting that formed part of the Turner Bequest to the nation after his death. Due to its poor quality, his verdict had to be ‘after J. M. W. Turner’, derived from ‘The Golden Bough’ and from a reproductive engraving such as Prior’s, which also explained the greater contrast between light and dark areas in the painting than in Turner’s original. Pieter van der Merwe reported that the original painting was bought by Robert Vernon in 1834, and exhibited in the Vernon Gallery, which allowed copying. He questioned the dating and commented that the capital inscription of the title on the back, and the rough simulacrum of one of J. M. W. Turner’s more formal modes of signing seemed similar. Andrew Greg added a final comment about the title and signature after consulting Butlin & Joll (1984 edition); he concluded they were both false. He mentioned Turner’s mastery of materials and technique and knowledge of natural forms, but such qualities were hard to discern in the Doncaster work. He compared the painting with other Turner paintings for brushwork and decided that the artist was familiar with Turner’s oil studies. Finally, he agreed with Richard and Pieter, and recommended that the painting is ‘after Turner’, probably derived from T. A. Prior’s c.1860 engraving of ‘The Golden Bough’. He felt that the canvas and ‘stretcher’ looked nineteenth-century, so a date of c.1860–1910 might be appropriate. The collection was notified and Art UK listed the painting as after Joseph Mallord William Turner, with an execution date of c.1860–1910. A short painting description was also authored.